CML Microcircuits (www.cmlmicro.com), a leader in the design, development and supply of low-power analogue, digital and mixed-signal telecommunication semiconductors, has expanded its DuraTALK digital voice processor range with the release of a new professional radio low bit-rate 2.4Kbps vocoder. The CMX7262 is a high-performance low bit-rate vocoder for professional two-way radio, providing market-leading high quality voice and excellent performance in real-life radio operation. This is achieved through the use of the latest state-of-the-art voice coding technology called "Tri-Wave Excited Linear Prediction" (TWELP), developed by the digital voice coding experts at DSP Innovations. 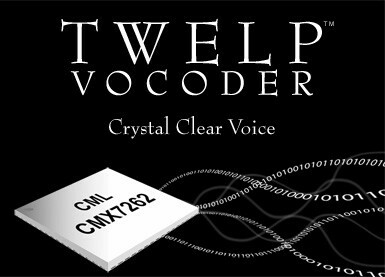 Sergey Vershinin, CEO at DSP Innovations, said: "We are excited that CML Microcircuits has utilised our advanced TWELP-based 2400 bps vocoder for their new high-performance voice chip. TWELP technology is the result of our many years' work. It provides the best voice quality available from all known today coding methods (MELPe, AMBE+2, ACELP, WI) giving natural sounding speech as well as high-quality non-voiced signals such as police and fire service sirens." David Brooke, Head of Product Strategy at CML, said: "With the continuing transition from analogue to digital radio there is a growing need for high-quality, low-cost vocoder options. The CMX7262 expands upon CML's DuraTalk range of flexible digital voice products, complementing the popular CMX6X8 range of low-cost RALCWI vocoders. The device is a unique product offering for the digital two-way radio market, providing unrivalled natural sounding voice as well as clear non-voice signals. The clarity of the TWELP coding brings digital voice another step closer to the original analogue and provides an ideal solution for professional radio applications where there is a need for high-quality speech, as well as non-speech signals." The CMX7262 TWELP vocoder provides a highly-integrated solution with optimised signal processing ensuring lowest power consumption. Voice is handled in 20ms frames ensuring compatibility with recognised digital PMR standards as well as CML Microcircuits' range of dPMR baseband processors. Supporting the voice coding function is a robust forward error correction (FEC) scheme, an important feature to mitigate errors inherent when transmitting over narrowband radio channels in challenging conditions. Background noise reduction has also been implemented to further enhance voice clarity. 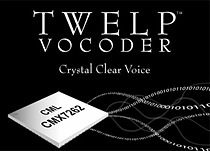 Unlike other purely digital-based solutions, the CMX7262 integrates a voiceband audio codec (ADC/DAC functionality), input/output amplifier and loudspeaker driver with digital gain control to give a complete solution of analogue voice in to vocoded data out and vocoded data in to analogue voice out.